. . . Good morning, it's quarter before six at Seattle's KOL, the station that plays too much music . . .
To my ear, Robin Mitchell does everything right on this pair of airchecks from Seattle's KOL in February, 1971. As off-air Program Director, he likely had not been on the air for months and probably not have been awake at 5:00 a.m., when the first aircheck begins. Debuting just after the 35th anniversary of their original broadcast, this exhibit includes much of the TM "Where Your Friends Are" jingle package. These two airchecks introduced those jingles and the Terry McManus-voiced production elements to KOL listeners. These are Robin's own studio recordings copied from 15 ips mono tape to Dolby cassette in 1988, then, more recently, to CD. REELRADIO has recreated the airchecks in unscoped stereo by adding the music. I've always loved Terry's imaging work. "Serving the Northwest since 1922" shows a station that was proud of its history, which was almost as rare then as it is now  especially for a Top 40 station aiming at a "young" audience. They had a heritage to be proud of, already slugging it out in the '50s with perpetual Top 40 leader KJR. KOL was also the station that brought the late Lan Roberts to Seattle from New Orleans in mid-1961, then lured him back from KJR in 1969 as Program Director. If you ever listened to KJR, you will recognize the Attention Tone that Robin uses so freely, and to such great effect. Its history at KOL was filled with contradictions. In the mid-'60s, when Dave McCormick brought the Drake style to KOL from Fresno, KOL had such a different sound than KJR, but made heavy use of the Attention Tone. By 1969, KOL had moved heavily into personality radio, which had been KJR's winning formula, but the Attention Tone had disappeared from KOL. So, it is a real surprise to hear it here. But, then again, many of the KOL DJs only rarely played a jingle. I, like most KOL listeners, was confused about Robin Mitchell. He hadn't had a regular air shift in years, but he voiced many of the station's promos and ads. In fact, he left the station for nearly a year in 1969, with a short stint at KING Seattle and PD at KEED Eugene, before being offered PD at KOL. Robin began his career in Portland in 1964 with his First Phone license and a weekend job at KKEY Vancouver several months before graduating from high school. I undoubtedly heard him, as Jerry Johnson, when he moved to Top 40 KYMN, patterned after Denver's KIMN. 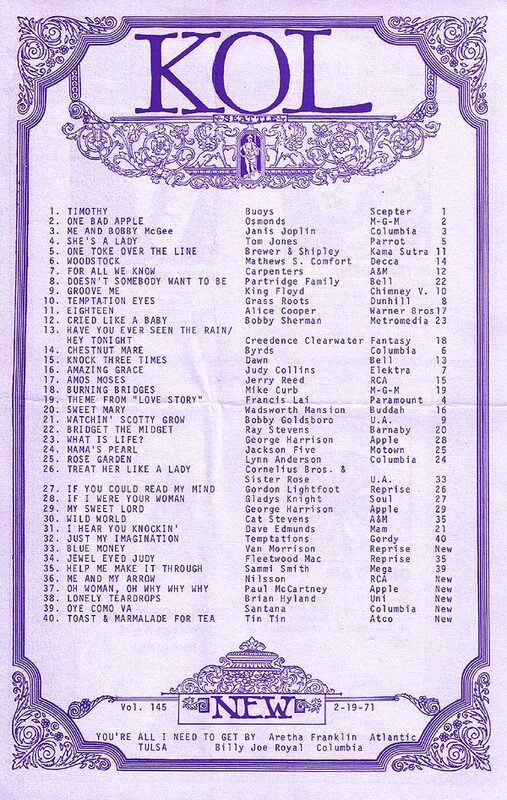 Early in 1965, KYMN switched to background music, and Robin went to Oregon Top 40 stations K-GAL, KEED and KASH before being hired by KOL in 1967. In 1972, he left for WRKO, then WIFE, KYYX, KLBB, KRCK, KRXY and KKUR, before a long stint back in Portland PD'ing KWJJ-FM. He currently manages six stations in Eugene, Oregon. By this time, I had been listening to KOL every day for about five years. On this particular day, I didn't hear Robin, but I do remember Robert O. Smith doing AM and PM Drive that week, to help cover for Lan Roberts' vacation to Honolulu. Robert O. tells me that he was given a small color television by the station in appreciation of his extra work. KOL really did debut upcoming hits, as you will hear Robin allude to in this aircheck. Proof positive is the airing of Carly Simon's first hit, nearly two months before Billboard charted it, three months before WLS and four months before CHUM. If you are confused by some local Seattle references, the following explanations might help. Burl Barer's Nighty with the Springfield Rifle is neither dress nor weapon, but a short early evening show at a local high school featuring a local group whose biggest hit was "Start from the Bottom". Robin's "First, Boeing...what a loss for Seattle" refers to the Dec. 3, 1970 government cancellation of Boeing's Supersonic Transport (SST) contract that almost wrecked the Seattle economy. To date this aircheck, Bruce Portzer and I played amateur historians. 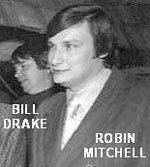 I narrowed it down by knowing that Robin returned to KOL in 1970 and that Robert O. moved to PM Drive on KOL-FM in mid-1971. A review of the music played against Billboard data narrowed it down to early 1971. 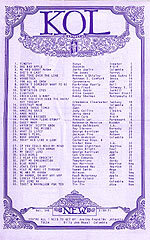 Robin's only mention of chart position is #1, "Timothy" by The Buoys, which Bruce checked against his collection of KOL charts: Feb. 12 to March 5 all list Timothy as #1. Robin referred to "Friday, February 26th" as a future date in one of his recorded commercials, and repeatedly mentioned Monday as today, so that narrowed it down to February 15 or 22. A perpetual calendar verified that 1971 is the right year, i.e. - that Feb. 26 was a Friday that year. The final piece of the puzzle is in the newscast read by Robin at 5:55 a.m. "Last Friday night" is when retired Seattle Police officer Hazard P. Butterfield was shot to death in his home. Bruce found an Internet genealogy database but it only listed the month and year of Patrolman Butterfield's death. I thought the easiest solution would be to contact the Seattle Police Department, but Bruce suggested a visit to the Bellevue Public Library in his lunch hour. There he found microfilm of the Seattle Times back to the 1960s. The Feb. 20 '71 paper has the story from the night before.